Not your typical “girl next door”, Beverly Roberts, the daughter of Outlaw biker Jim “Flash 1%er” Miteff, was riding on motorcycles before she could walk. Now, more than 40 years later she has published a handpicked selection of her father’s photographs. Portraits of American Bikers: Life in the 1960s is the first in the series of three books that make up the collection. 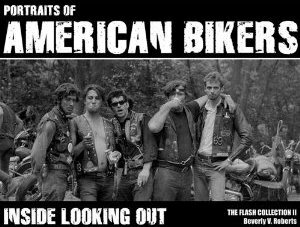 Portraits of American Bikers: Inside Looking Out (the second book in the series) will be released in April of 2010. All three books in the Outlaws MC series are published by Flash Productions, LLC. A retired stockbroker, Beverly owns the publishing company named after her late father. Beverly asked me to review the books and I did. I was blown away by the true life detailed black and white photo’s of these gritty 1960’s 1%ers. This is a collection of real life pictures full of detail showing the bikes, the clothes and the living conditions of the 1960’s Outlaw. This is not Hollywood, this is the real deal. I didn’t think that my writing was up to the job of describing these books well enough so I brought them to one of our local HOG meetings to get some inspiration. I passed them around to some of the guys that I thought would appreciate the time capsule. They loved the book and it brought back a lot of memories for those guys of old BSA’s and Triumphs. Someone liked the books so much they took them home with them… oh well. Easy come easy go. That’s an endorsement! These books are good enough to steal! Just kidding. I’m sure my friends will return my books to me. Click here for more info about the book at my Amazon store. You can vist www.flashproductionsllc.com to order poster size prints of this unique photo collection depicting a unique part of our American Biker History. This is where it started!